I finally Hung the Canvas o’ Awesome! Remember way back….WAY back….like March or so….I entered this killer contest by @sthrnfairytale. I won that contest. YAY ME! 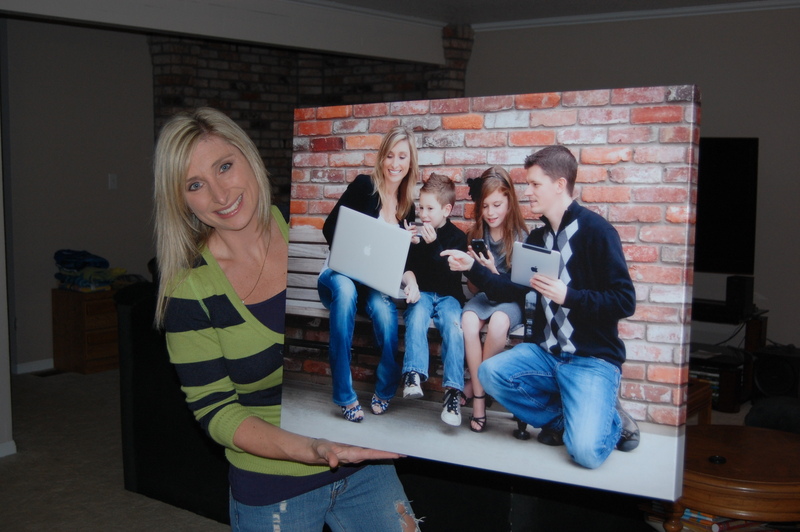 I won a 16 x 20 Canvas Print (which I upgraded to a 30×24 cuz..well, duh) by Canvas Press which then offered people a discount code of 10% off called JENN10 (YA, I totally got my OWN discount code at a REAL place!). I’m such a BIG deal! Well, since my house has been under construction since the day we moved in, I hadn’t haven’t wouldn’t didn’t had not (please send english teacher to help me) hung this print of AWESOME because I wanted to figure out the very best location. I was waiting this whole time to paint the back wall of my staircase…. My mother-in-law was over the other day. Her: why haven’t you hung that picture? Her: Hang it next to the brick fireplace. Me: Ummm, we don’t want people to walk into our house and that be the first thing they see. Won’t people think we are dumb and arrogant?? We are certainly not pompous people who flaunt our Apple products….that often…. She INSISTED that it would look great and would NOT make us look like IDIOTS. So, I hung it up. And I LOVE it. It kind of looks like it was supposed to be next to the brick! 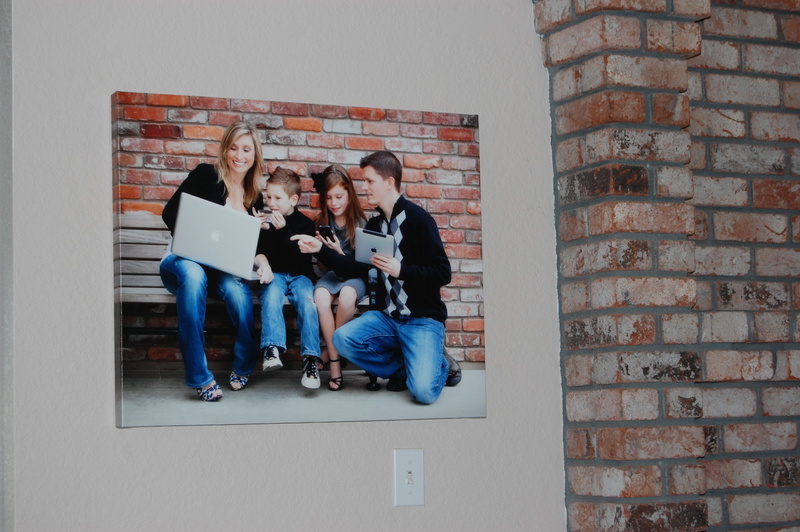 An incredible way to display a photo ~ Plus I WON this! Mmmk, so here is the dealio! A few months back (or last month?) 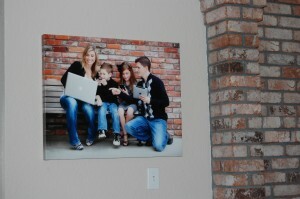 I came across a blog (Canvas Press Gallery Wrapped Canvas Giveaway) by one of my fav ROCKSTAR bloggers @sthrnfairytale. I was all, “well, ya, duh, of course I WANT THAT!” But I never win things, so I commented, tweeted, begged, blew kisses….did EVERYTHING I could to get entered. So, after I FREAK out and FAINT calm my nerves, I announce it to EVERYONE I know, as well as random strangers in my path. I won a 16×20 print, including shipping. It was a value of $119.39. Be still my heart. So, guess what I did. Yup. I UPGRADED!!!!! 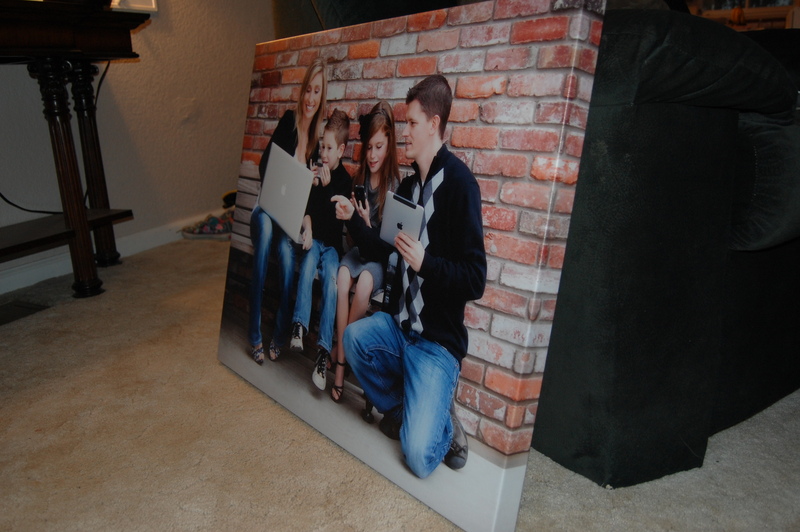 I ordered a 30×24 because of the photo (taken by the FABULOUS Roxi Mueller) I selected. I *might* have to build a wall to put it on, but hey, it’s TOTALLY worth it! *DISCLAIMER: Prior to seeing the post by Southern Fairytale, I had no idea how I wanted to display this picture of my family! It was too different for just a frame! It needed something special! The photo I chose is the Apple pic that I actually sent to Steve Jobs! Yes, we are all holding different Apple products, but that is NOT what this post is about. Anyhoooo, I am soooo unbelievably happy with this print, AND I want to HIGHLY RECOMMEND CANVAS PRESS to EVERYONE on the planet! So, in honor of this post, Canvas Press has created a SPECIAL promo for you all. So, go (RIGHT NOW) and order a print from them. In the checkout area, enter the PROMO Code “JENN10″ for a special 10% off. BOOM! That’s right, I got MY OWN discount code! Seriously people, I have MOVED UP in the world! As for where I am going to hang this UH-MAZING print, in my staircase. 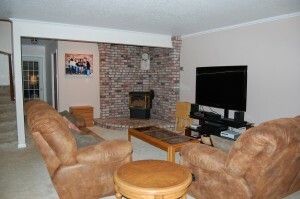 The back wall that you can see from downstairs as well as upstairs.